I was recently looking for an interesting way to prepare some beautiful potatoes that I had picked up from Costco. 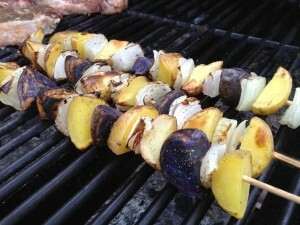 I like the colorful potatoes including new red, yellow and “purple” ones because they add color to dishes. 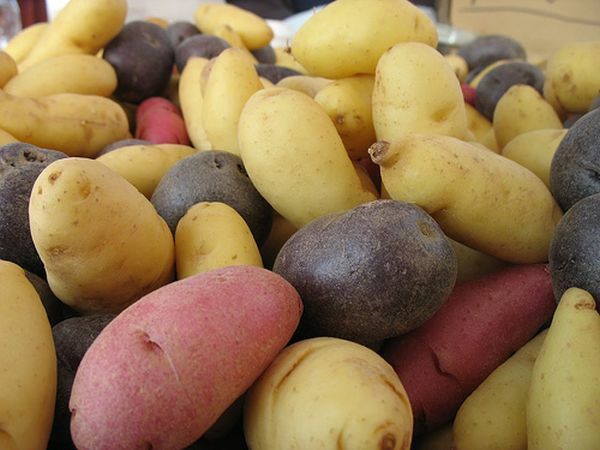 One might wonder if colored potatoes are healthier than white ones, but according to Whole Foods, the differences in color between varieties of potatoes are basically differences in carotenoid and flavonoid content. Virtually all types of potatoes provide significant amounts of approximately seven to ten nutrients. While we Americans are accustomed to potatoes with a white inside, potatoes in other parts of the world more commonly have starchy yellow insides. In the U.S. we call potatoes with yellow insides “specialty potatoes.” However, worldwide they are the norm rather than the exception. Anyways, I find that preparing potatoes on the grill is very easy and requires very little work or attention. And although potatoes are healthy, I still try to keep our carbohydrates to a minimum (to help the waste line) and this is an easy flavorful way to include some in a meal. 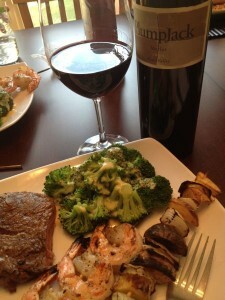 Along with some onions, this is an interesting and tasty addition to a dinner! 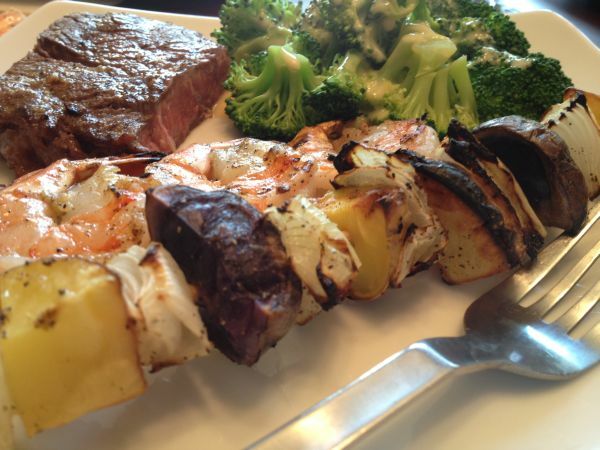 As many potatoes as you are hungry for…. Soak wooden skewers in water. Wash potatoes and chop into bite sized pieces. 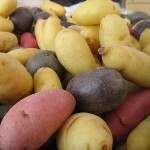 Place potatoes in a microwave safe dish, rinse with water and cover with plastic. Microwave on high for roughly 4 minutes, drain. 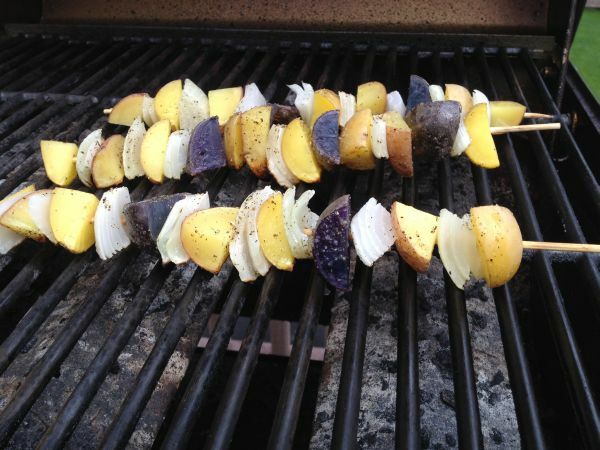 Arrange and alternate white, red and purple potato chunks with raw onion between the pieces of potato. 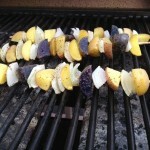 Combine smashed garlic with olive oil and drizzle over skewers. Sprinkle with salt & pepper and grill over medium heat rotating skewers and brush with reserved oil until cooked to your liking. We like some of the charred crispy edges! Share the grill with other prepared grilling items and enjoy! We served this along side of a nice steak, some shrimp & garlic skewers, fresh broccoli and a delicious bottle of Plump Jack Napa Valley Merlot! It was WONDERFUL as we reminisced about our friend Mark who works there while we ate dinner!